There are many varieties of wire and cable insulation suited to a variety of needs. 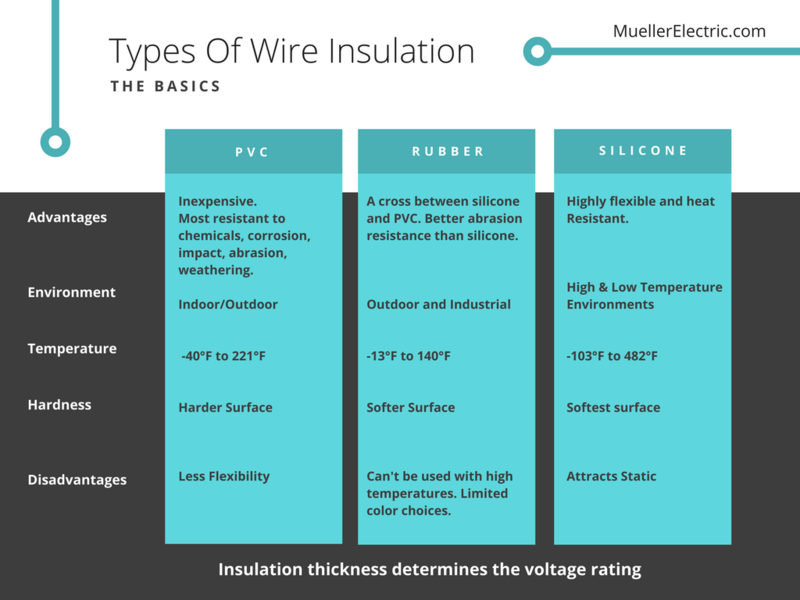 Insulation is made of a non-conductive material that surrounds the wire and will resist an electric current. Keep in mind that The thickness of the insulation determines the voltage rating. You can get high voltage from any kind of insulation depending on the thickness. PVC is the most common type of insulation and the least expensive and has a wide ranges of uses. It’s very resistant to chemicals, corrosion, impact, abrasion, and weathering. The temperature range is -40°F to 221°F. The wire is generally hard to the touch and doesn’t provide as much flexibility as other types of wire. Silicone is highly flexible and heat resistant and is preferable to use for extreme temperature environments from -103°F to 482°F. It is soft to the touch. A downside of silicone is that it is generally more expensive and also attracts static so it has a tendency to get dirtier than other wires, as the dirt is attracted to the outside of the wire. Natural rubber can be thought of as a cross between silicone and PVC in terms of some of its advantages and disadvantages. It has better abrasion resistance than silicone but not always as chemically resistant as PVC. It’s better suited to outdoor and industrial environments. Its temperature range is -13°F to 140°F which is less than the other two kinds of insulation.